Israeli troops have placed under six-month administrative detention a female Palestinian MP who is involved in the PA’s relationship with the International Criminal Court. Israel has been fiercely opposed to Palestine joining the ICC. Khalida Jarrar, 52, is a senior political leader of the left-wing Popular Front for the Liberation of Palestine (PFLP), a faction of the Palestine Liberation Organization. She was seized by a squad of some 50 IDF troops in the middle of the night last week, as they stormed into her house in Ramallah, her husband Ghassan Jarrar told RT. “They attacked our house at about 1 a.m. They broke the door… They isolated me in another room and stayed in my house for about an hour. Finally they kidnapped my wife, Khalida,” he said. He added that the IDF violated an agreement with the Palestinian Authority under which the Israelis are not supposed to detain elected Palestinian officials. An Israeli military commander later ordered the administrative detention of Jarrar for six months, the maximum term Israeli law allows a person to be held in custody without a charge or a court order. The MP joins over 450 people currently held in administrative detention in Israel, according to the Addemeer Prisoner Support Association. The number is lower than it was three years ago, before Israel scaled down the detentions following a prolonged hunger strike by detainees. Israel says the practice is effective in preventing militant attacks, but human rights activists say the large-scale use of such detentions amounts to abuse of power. 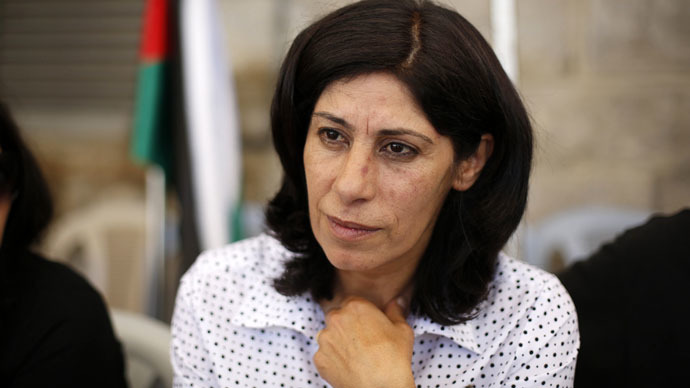 Israeli intelligence agency Shin Bet views Jarrar as a major advocate of military resistance against Israel and said she incited PFLP followers to launch terrorist attacks, according to the Jerusalem Post. The IDF reportedly seized Jarrar for violating an order issued in August 2014 that bars her from leaving the city of Jericho. The restriction basically exiled her from her Ramallah home, and the politician campaigned against it. Her position as a member of the team that oversaw the Palestinian Authority becoming a member of the International Criminal Court last week led to suspicion that the arrest may be a punishment. “This is how Israel seeks to deter every Palestinian public activist – not to mention one involved with advancing the processes in the International Criminal Court – from realizing his or her rights,” the doveish Israeli newspaper Haaretz said in an editorial. Jarrar’s arrest brings the number of Palestinian legislators currently held in Israeli prisons to 16.